With its delicate flavor and light, soft flesh, herring makes a pleasing addition to your diet. It also offers a safe fish option because it's low in mercury, according to the New York City Department of Health and Mental Hygiene. Each 6-ounce portion of herring contains 332 calories to fuel your active lifestyle and provides healthy fats and protein, along with essential minerals and vitamins. These nutrients work together to maintain tissue function and offer a number of health benefits. Making herring a part of your diet keeps your red blood cells healthy. Red blood cells require hemoglobin -- a protein containing chemical complexes, called heme groups -- to function because hemoglobin binds to oxygen so that the cells can transport it throughout your body. The iron and vitamin B-12 found in each serving of herring both help you make this hemoglobin. The protein in herring also serves as a source of amino acids, which your body needs for hemoglobin production. Each 6-ounce portion of herring offers 28 grams of protein as well as 1.9 milligrams of iron and 17 micrograms of vitamin B-12. This makes up your entire daily vitamin B-12 intake requirement, along with 24 percent and 11 percent of the daily recommended iron intakes for men and women, respectively. Herring also comes packed with minerals important for skeletal health. It provides you with calcium, magnesium and phosphorus -- three nutrients that your body uses to make hydroxyapatite, the mineral complex that makes up your teeth and bones. Herring's protein content also nourishes your bones by helping you make proteins -- such as collagen -- that also contribute to bone strength. A 6-ounce serving of herring contains 141 milligrams of calcium and 388 milligrams of phosphorus -- supplying 14 percent of your recommended daily calcium and 55 percent of your phosphorus needs. Each portion also offers 54 milligrams of magnesium, which makes up 17 percent of the recommended daily intake for women and 13 percent for men. Eat herring to nourish your nervous system. Each serving offers 2.8 grams of DHA and EPA -- two types of omega-3 fatty acids. Your body uses omega-3s to promote healthy brain function, and low omega-3 fatty acid levels might increase your risk of Alzheimer's disease. The potassium found in herring helps your nerve cells send electrical signals -- a process central to brain function -- and herring's vitamin B-6 helps you make chemicals important for nerve communication. A serving of herring contains 719 milligrams of potassium -- 15 percent of your daily requirement -- as well as 0.8 milligrams of vitamin B-6, or 62 percent of the recommended daily intake. 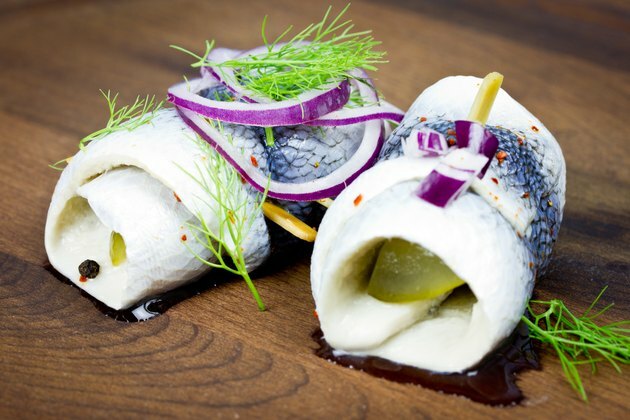 Broil or grill your herring to cook it without the need for added fat, or poach it in no-sodium broth, over a bed of lemon slices, for a more flavorful option. Skip sodium- and fat-laden sauces, and instead season your herring with fresh herbs and spices, such as cracked peppercorns or chopped parsley, as well as lemon or lime juice. Alternatively, make a healthy and higher-protein version of creamy dill sauce by mixing nonfat Greek yogurt, fresh chopped dill and fresh lemon juice. Are Anchovies Good for You?